The boys’ hostel consists of a three storey accommodation secured by a round-the-clock security system manned by professional guards and looked after ably by a team of wardens and attendants. 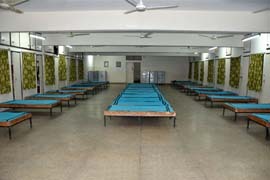 Similar to the girls’ hostel the boys are housed in 6 large dormitories with attached washrooms and storerooms. The dining hall is on the ground floor. All modern facilities that facilitate good living are provided. Supervised after school studies is monitored by the hostel wardens. Residents are encouraged to pray daily. Discipline is the cornerstone of hostel life and an equal emphasis is placed upon physical development.